This is sad news. When I was a child, Frank Joyce was always on the radio and had a weekly segment on one of the local tv newscasts. I always liked him. It wasn't until years later that I found out about his connection to the Roswell crash and that made him even cooler. Joyce was in his 20s working at Roswell radio station KGFL in 1947, said his son, Ron Joyce. "All I'll say is he was the first reporter at the scene," he said about his father. Frank Joyce thus became connected with the famous UFO story. 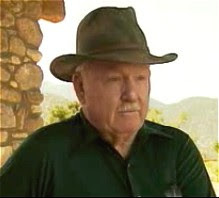 He was interviewed about the incident a number of times over the years and depicted in documentaries and movies, such as the TV film "Roswell." "They did several interviews with him on CNN and The History Channel and various UFO documentaries," his son said. I remember Frank from his fishing reports on KOB back in the 70's.